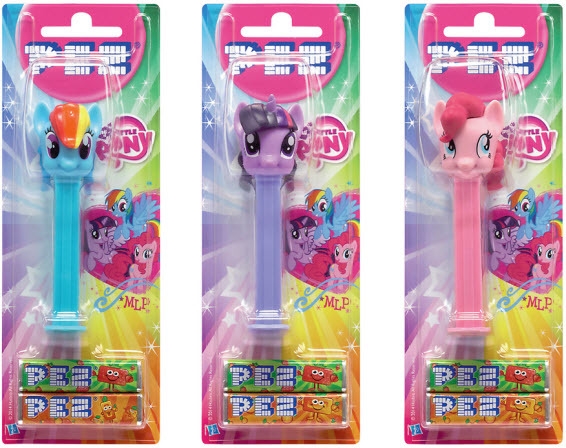 PEZ and Hasbro have partnered for a line of My Little Pony PEZ dispensers. The PEZ dispensers were introduced at the Hasbro booth at the Brand Licensing Europe in Olympia, London. There are three Pony's featured in the new line. They include Pinkie Pie, Twilight Sparkle and Rainbow Dash. The fruit candy flavors in the dispensers will include lemon, strawberry, orange and cherry flavors. The new PEZ dispensers are now in stores nationwide.